The Historic Quayside in Exeter is one of the most attractive parts of the city and is ever popular with locals and visitors alike for its fascinating history, interesting architecture and lively pubs and restaurants. One of these is the On the Waterfront restaurant and pub, a bustling and popular venue all year round. 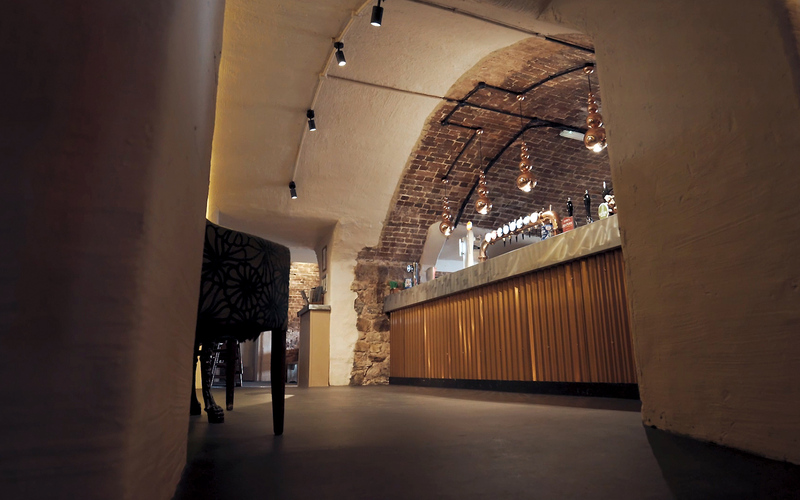 Built inside a 19th-century dock warehouse, it is one of the most unique spots Exeter has to offer. We were approached by Mark Eastman of South Devon Inns to discuss the project and learnt of his intention to demolish the main bar and rebuild it with a new servery and outside counter. The goal was to enhance the bar area, improve space for the staff working within it, and open up access to alfresco customers all year round. Mark Green understood our concept very quickly, and produced design ideas we would not have thought of. We love the use of zinc! Once the overall design was agreed the most amazing number of very detailed drawings appeared. When we came to the build, these turned out to be invaluable and meant that the construction phase went virtually without a hitch, which is a first for us! We are very pleased with the result and thrilled with Mark’s final design touch: a two-way mirror wall with TV monitors behind which will be a fantastic communication vehicle with added pizzazz. We devised an exciting design, that retains the Waterfront’s distinctive atmosphere, whole allowing for better customer flow and service. Copper and zinc were central to the scheme, to marry with the buildings warehouse past. 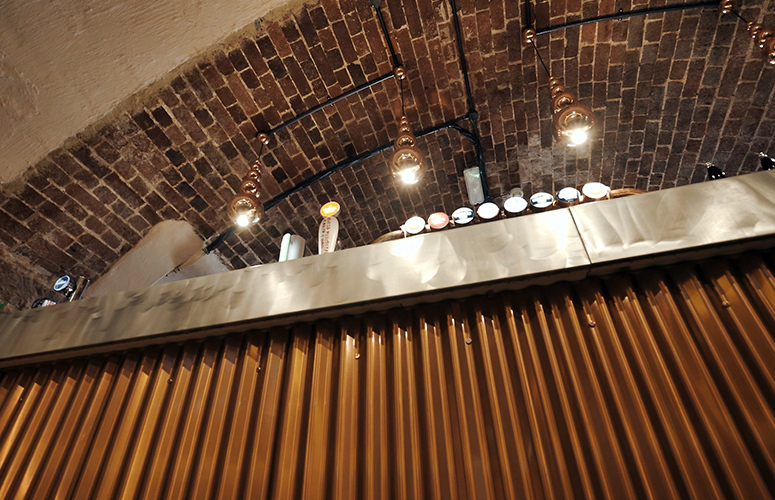 The pub has amazing brick vaulted ceilings and we were keen to use reflective materials to enhance them. Light now bounces off the metal finishes and a mirror which houses digital signage draw customers attention. Space and light is the overall effect, as the working area of the bar has more than doubled. 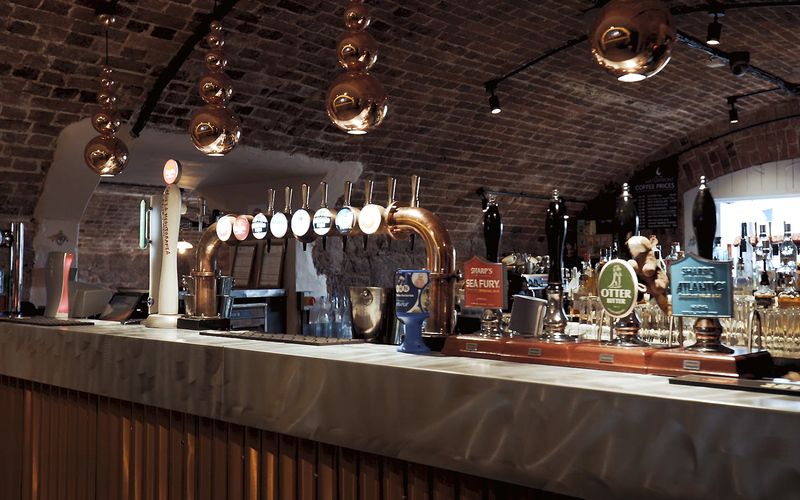 The improvement in customer experience through easier access to the bar, quicker service is another reason to visit this lovely restaurant in Exeter’s historic Quay. Interior, print, digital and graphic design services. We can help with your next project. Find out more about us by clicking here or give us a call on 01803 295 959.